Barrie Colts Opening Weekend Recap - 22/09/16 - 26/9/16. #OHL - Very Barrie Colts | A website covering the Barrie Colts of the OHL. This past weekend was the opening weekend for the Barrie Colts 2016-17 regular season. The team kicked off the season on the road facing the Kingston Frontenac's and the Ottawa 67's this past weekend. Here is a look at those games. Barrie came out strong in the opening frame generating 11 shots on Fronts goalie Mario Peccia. Barrie got their first look t the power play this season 59 seconds into the game but were not able to convert. Barrie Colts goaltender David Ovsjannikov only faced 5 shots in the opening period and managed to stop all of them. The first period would end 0-0. The second period was a little more aggressive. 7:03 both teams lost a player for two minutes when Carbonara and Field would both take roughing penalties. Both teams would exchange penalties before Anthony Stefano would score his first goal of the season. Captain Cordell James and Ben Hawerchuk would both get assists on the goal. Barrie would take the 1-0 lead. Tighter period chance wise. Colts had the edge in shots out shooting Kingston 12-11. Kade Landry would take an early holding penalty and the Fronts would make them pay for it a little more than 30 seconds into the man advantage. Jason Robertson would score first for Kingston with the man advantage. We have a 1-1 tie. Kingston would generate the majority of the chances and shots over the next 10 minutes but Colts goalie Ovsjannikov was up for the challenge. It would be Ben Hawerchuk who would get on the board next when he put the Colts ahead 2-1 with a little less than 6 minutes left in the period. Curtis Douglas would earn his first career OHL assist on the goal while Matt Brassard would get his first assist of the season. Colts took the 2-1 lead. Despite heavily out shooting the Colts 14-4 in the period, the Colts managed to fight them off the win the season opener 2-1. Kingston out shot Barrie 30-27. Colts 0 for 3 with the man advantage while allowing 1 goal on 2 penalty kills. Ovsjannikov stopped 29 of 30 shots. Face-offs won: Kingston 39, Barrie 28. Colts win season opener for second year straight over Kingston. 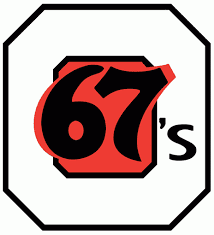 67's hosted the Colts on "Guaranteed win night" in Ottawa. No way that is a bad idea, right? This game was a lot more aggressive than the season opener the Friday before. Brassard would take a cross checking penalty moments into the game. Both teams would exchange a couple more man advantages before Kyle Heitzner would score his first career OHL goal. The goal came 9:37 seconds into the period. Kirill Nizhnikov and Kade Landry were both credited with assists on the goal. Colts would take the 1-0 lead. Not even 3 minutes later the 67's would strike back. Kody Clark (son of former Leaf captain, Wendel) would score to tie the game at 1-1. Both teams exchanged man advantages but neither could take advantage before the period would end. The period ended with both teams tied 1-1 with Barrie leading in shots 7-6. Second period started scrappy. Both Murray and Fanjoy would be taken off the ice with offsetting minors. Shortly after, Barrie Colt Joey Keane would take a tripping minor, giving Ottawa the man advantage. It would be Barrie that would score on the penalty kill when Zach Magwood would score his first goal of the season giving Barrie the 2-1 lead. Tyler Tucker got the lone assist on the goal. At 5:54 Brassard would score a power play goal to put the Colts up 3-1. Stefano earned an assist on the goal. Less than a minute later, Kirill Nizhnikov would take a tripping call. The team managed to kill it off and when Nizhnikov left the box he would come out to score to extend the Cotls lead to 4-1. Ottawa would strike back minutes later when Fanjoy would put the 67's on the board cutting the Colts lead in half 4-2. Both teams took late penalties but Barrie left the period with 1:31 minutes of PP time to start the 3rd period with. Barrie left the period with a 4-2 lead, out shooting Ottawa 16-10 in the period. 28 seconds into the period, Colts captain, Cordell James would score a PP goal to extend the teams lead to 5-2. Brassard and Murray both earned assists on the goal. Ottawa took a couple more penalties but the Colts couldn't capitalize on either until 8:29 when Matt Brassard would score his second goal of the game. This would ultimately be the winning goal and was Matt's second goal of the game. Murray and Stefano both credited with assists. Ottawa would score a couple more goals but Stefano would score a empty net goal late as insurance to clinch the 7-5 win for Barrie. Murray earned an assist on the goal. Barrie out shot Ottawa 34-24. Colts went 2 for 7 on the man advantage while not allowing any goals on 7 penalty kills. Ovsjannikov saved 19 of 24 shots faced. Face-offs won: Barrie 29: Ottawa 30. Matt Brassard scored 2 goals and got 1 assist. Scored the game winner. 6 shots on goal. Anthony Stefano scored a goal and 2 assists. Barrie are now 2-0 on the season. They hope to extent their winning streak to 3 games when they head to Sudbury to face the Wolves on Friday then come back to Barrie on Saturday for their home opener against the London Knights.